The 10 commandments. MassGenomics, one of my favorite ‘omics blogs, has published an interesting piece on basic rules for next generation sequencing. Even though MassGenomics is usually geared towards people in the bioinformatics field, this post is more general and fun to read! This and that. The “Spike activity” newsletter of the Mind Hacks blog has pointed me towards two interesting posts this week. The first is from the DANA foundation blog on genetic risk factors for psychiatric disease, the second is from Not Exactly Rocket Science on the Human Brain Project, which aims to simulate a human brain at an unprecedented scale. Nobel Prize 2.0. Several blogs including Nature blogs reported on the $3 Mio USD Life Science “Breakthrough” Prize that was awarded this week. According to the founder of this prize, the names of the awarded scientists should become “household names” and the prize might become a second Nobel Prize for life scientists. SHANK3 paper retracted. The SFARI blog reported on a recent retraction that is relevant to neurogenetics. SHANK3 is one candidate gene for neurodevelopmental disorders. Now, the researchers find that there might have been some issues with the first report of the mouse model for this gene. Rare variant analysis of trios with GATK using two different batches. Batch 2 show a larger number of rare variants transmitted from father and mother to the affected child. 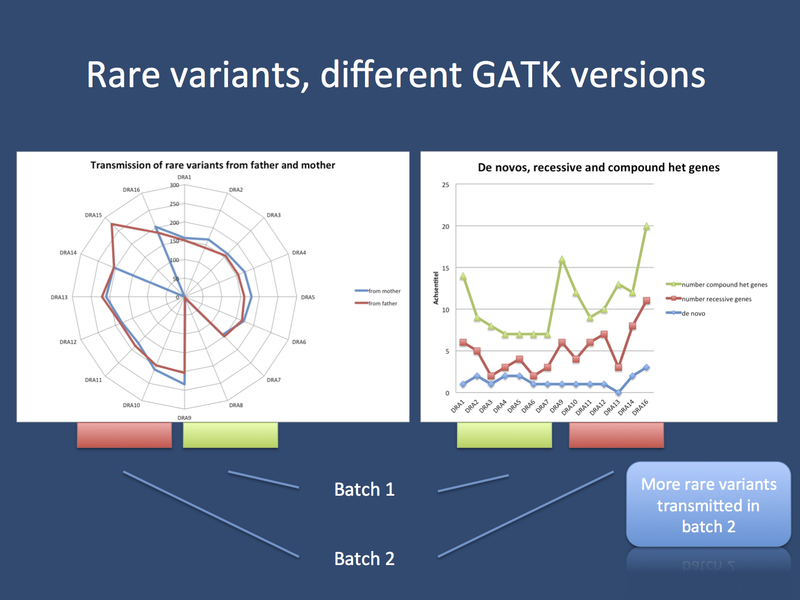 This difference between batches is probably due to a small change in the reference genome that has been used for variant calling. Rare variants, again. Following up on last week’s post, we have continued our analysis of rare variants in trios. We have compared two batches of trios analyzed for transmitted rare variants, the prerequisite to a homozygous and compound recessive analysis. Interestingly, a simple upgrade of the calling algorithm with a slight change in the reference genome already leads to a “batch effect”. We find more rare variants on average with the newer version. This simply points out how fragile genomic data is and how difficult it will be to use these types of analyses for complex genetics. This entry was posted in 2013, summary and tagged Breakthrough Life Science Prize, Dana Foundation, Human Brain Project, MassGenomics, Mind Hacks, next generation sequencing, SFARI, SHANK3, Spike activity. Bookmark the permalink.